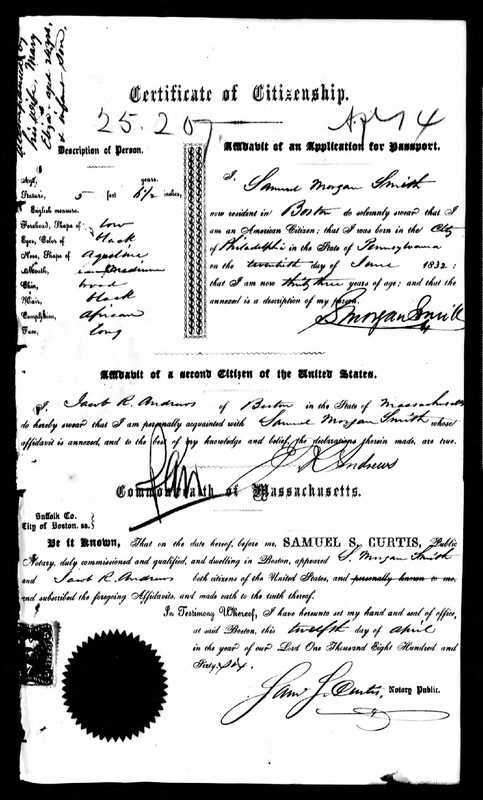 Smith's certificate of US citizenship (click to enlarge). In the late 1860s and early 1870s the talented African American actor had a hectic work schedule touring all over Britain. He visited many towns and cities taking on a wide variety of roles. It is possible that he performed at Hull during this period as advertisements with the Black actor dressed as Othello were visible in the city. On 10 December 1869, the Hull Packet advertised a 10 shillings reward for information that would lead to the conviction of the ‘evil-disposed person or persons’ who had torn ‘a Coloured Lithographed Portrait of Mr Morgan Smith, coloured Tragedian, in Character as “Othello” from the Hull Advertising Van.’  However, evidence of his actual performances in Hull at this time has not yet been found. Hull Packet, 10 December 1869. While there is a degree of uncertainty as to whether Smith came to Hull, there is no doubt that he performed in East Yorkshire during the summer of 1875. In June ‘Mr & Mrs. Morgan Smith’s, Unique Drawing Room ENTERTAINMENT!’ was showcased at the Public Rooms in Goole. The programme consisted of selections from Shakespeare and other great poets. After their performances the Goole Times reported that the duo ‘were of a very high character and deserved more public support than they received. Mr. Smith as an elocutionist and reciter takes a good position, while Mrs Smith is a performer of satisfactory type. The manner in which she played her part in the laughable selection entitled the “Dumb Belle,” especially attracted attention. 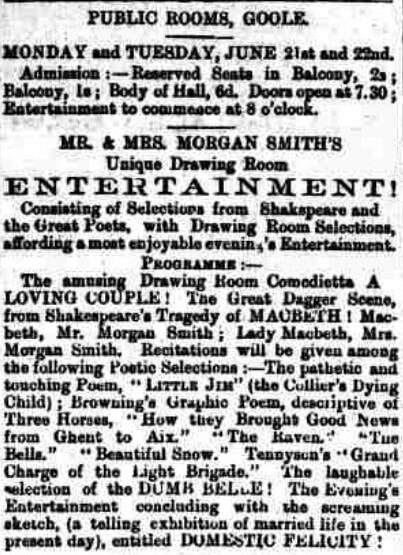 Sadly, this was Smith’s last performance in front of an East Yorkshire as he died at his home in Sheffield on 22 March 1882. Goole Times, 18 June 1875. National Archives and Records Administration (NARA); Washington D.C.; NARA Series: Passport Applications, 1795-1905; Roll #: 138; Volume #: Roll 138 - 01 Apr 1866 - 30 Apr 1866. Beverley and East Riding Recorder, 7 July 1866, p. 7. Jeffrey Green, Samuel Morgan Smith profile, http://www.jeffreygreen.co.uk/072-s-morgan-smith-the-black-actor-1832-1882, accessed 14/3/18. Ancestry.com. Scotland, Select Marriages, 1561-1910 [database on-line]. Provo, UT, USA: Ancestry.com Operations, Inc., 2014. Hull Packet, 10 December 1869, p. 4. Goole Times, 18 June 1875, p. 2. Goole Times, 25 June 1875, p. 2.